Compared to its predecessor‘s 1500 mAh battery, the one found in the LG Optimus 3D Max P720 has received a rather modest 20 mAh bump in capacity. Interestingly enough, a year ago we would have considered a 1520 mAh battery as a large one by any standard. Today however, it appears downright insufficient, especially when there’s a 3D screen waiting to be powered. As you have probably guessed by now, we approached the battery test of the LG Optimus 3D Max with a pinch of suspicion. Here goes the full breakdown. As always, we kicked off the device’s battery trial with a look at its talk time endurance. Quite surprisingly, the LG Optimus 3D Max P720 lasted for 8 hours and 42 minutes before it gave up – a result which is impressive given the modest battery on tap. Things took a different turn in the web browsing section of the test. Here, the smartphone achieved 4 hours and 10 minutes before calling it quits – hardly a dream-team result. Apparently, the extra 3D trickery the screen is capable of takes a toll on the battery even when not in use. The video playback time of the LG Optimus 3D Max P720 was even worse than we expected. The handset achieved only 3 hours and 28 minutes of 2D video playback on a single charge – a score which barely bested the worst performer in this section by a minute. A worse showcase in 3D is guaranteed on this instance. Despite the rather disappointing web browsing and video playback battery times, the LG Optimus 3D Max P720 managed the commendable endurance rating of 34 thanks to power-efficient standby mode. You would need to recharge the smartphone every 34 hours if you use it for an hour each of telephony, web browsing and video playback every day. 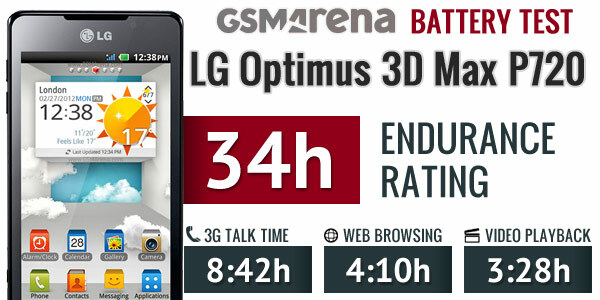 In a nutshell, the LG Optimus 3D Max P720 proved extremely efficient in standby mode, as well as talk time endurance. Given the 3D nature of the device however, we believe that those are not exactly the areas where a solid battery performance was top priority.